Happy new year! And happy 750th game landmark! It’s pure coincidence the two coincided, but I quite like that both happen at the same time. My search for a big game to play coincided with my quest to start some remaining franchises. I hadn’t played anything in the Final Fantasy Tactics series yet, despite some time with Final Fantasy Tactics Advance showing me it’s been good. It’s more Disgaea than Advance Wars and I assume that will hold up for the original game as well. 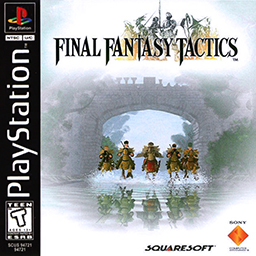 To start with the basics: Final Fantasy Tactics is a good strategy game. The battles are quite lengthy and start off quite difficult, but they make fo rfun puzzles and offer a decent challenged. Replaying them (because I forgot to save…) makes them easier, but still leave enough of a challenge that it isn’t just repeating the same moves. There’s a big list of possible classes with their own setups that I haven’t gone deep enough in, but so far it’s been quite satisfying. I noticed I needed to more work to get the party balance right – no guidance here – but I’ll get there. You’re also regularly joined by AI characters who help you out, but they are useful a lot less often. Sometimes, they’re in the right place and really help out, but they seem to mess around too much sometimes and just get in your way. There are some other odd decisions too. For example, you can’t enter a dead character’s square. I guess this is for some sort of future resurrection ability, but right now it means they can get stuck it weird places that makes the level unintentionally more difficult. It’s part of the parcel that makes the game more difficult than it feels it’s intended to be at the moment and increases the learning curive a bit from before. A related downside are the cutscenes. They are slow – not just long, but they feel like they’re set up slowly and it gets a bit frustrating sometimes. The storyline didn’t really engage me yet, so I was hoping for more there. The game looks nice. The 3D environments are boxxy but easy to rotate, with sprite characters on top of that. It works really well to keep the game playable while giving it a nicely elaborate art style as well. Difficulty aside, this game does take what feels like a Final Fantasy story and puts it in this different battle mode and context that helps create a fun experience. I’d love to try and get deeper in it, but perhaps in an entry of the series that has advanced further.